‘Tipped’ off by a great little blog post by Polyxenos over at Polyxenos – Abstractions and Musings, I know you will be equally fascinated to learn of a Bronze age Minoan fresco from Akrotiri (Santorini) that appears to depict a Mycenaean shipboard war tactic described in Book 15 of Homer’s Iliad. clothed at their point in bronze. Following up on the lead provided by Verity, Polyxenos researched Theran frescoes and quite cleverly discovered a very interesting depiction that closely parallels Homer’s description. Polyxenos’ image was rather unclear, so I have taken the liberty to crop an image which I found on Wikimedia, white balancing it, enhancing the contrast slightly, and sharpening the focus a bit in order to view the shipwreck scene more clearly. The staves, or pikes as Polyxenos refers to them, are clearly sticking out from the two ships on the left, with three or four pikes apparently lined up side by side and fastened together in such a way as to create a formidable weapon against anything approaching the ship. This clearly parallels Homer’s reference in Iliad 15, to “the long jointed pikes that they had lying in the ships for fighting at sea,” don’t you agree? Then Teucer rushed to seize his arms, but Hector cast his spear. but Amphimachus it smote on the breast so that he fell dead. Then Hector seized the dead man’s helmet, seeking to drag the body among the sons of Troy. driving him backwards, so that he loosed hold of the helmet of Amphimachus. In light of recent DNA analysis showing that Mycenaeans and Minoans were genetically similar, it should come as less of a surprise that their shipboard warfare tactics were similar, too. Indeed, learning that “Genetically, the Minoans and Mycenaeans had the most in common with early Neolithic farmers from Greece and Turkey” goes a long way towards explaining why Hektor and Achilles both spoke the same language! In fact, this goes even further towards explaining why a Minoan fresco, ca. 1600 BCE, could realistically depict a Trojan War-era, ca. 1200 BCE shipboard defensive tactic, described by a Greek epic poet some 400-500 years later! A Literary Evolution of a Single Race? So, I’m wondering, does this new analysis imply that “Minoan” Linear A and “Mycenaean” Linear B may represent a literary evolution of a single race of people? How many neatly categorized archaeological sites and finds, as well as the wealth of history books and academic papers, will experience an interesting revolution if we ultimately recognize “Minoans” and “Mycenaeans” as one and the same people? I’ve seen the Akrotiri fresco and did not even consider there was a Mycenaean ship drawn. I will now need to have a closer look! 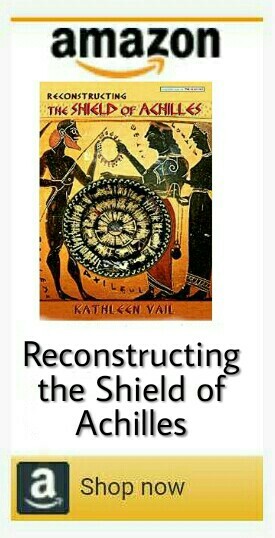 I had read about the DNA references between the Minoans and Mycenaean’s, and it does make logical sense there is a connection between them. I am not sure if you’ve seen the documentary about Pavolpetri, it does seem to tie in with the influences the Minoans had on early Greek culture, so there must have been liaisons as well. Stunning post about this ship Kathleen. I have never thought to study it closely. Thank you for your delightful impression of what was going on. Thanks, Rita! There’s a lot of detail in the beautiful Minoan frescoes! I know and I love them all,especially from Akrotiri. Have you been there. ? The site is fantastic. !! No, I’ve never been there but would definitely like to see them!